Our 3D scanner can capture high levels of detail in an artist's maquette or original sculpture which can be enlarged to any size. 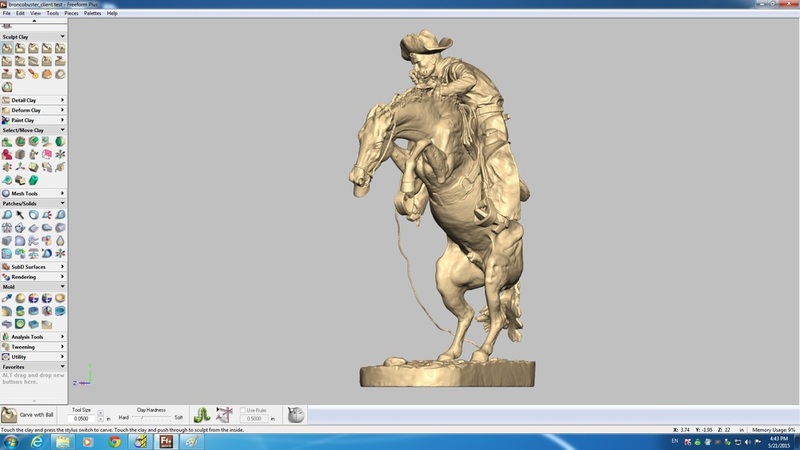 If your sculpture is of monumental proportions we can reduce to create full detailed miniatures via rapid prototyping. Because it is fully portable we can travel to your studio, public site, or even scan live models. 3D scan of human model. Digital foam enlargement of Martin Luther King Jr.
A variety of foam densities are available for the required level of detail. The foam can be raw, layered with clay for sculpting, or hard-coated and painted producing a final piece. Finished bronzes cast from mold of prototype. We can make limitless alterations, turn concepts or 2D sketches into 3D objects, even transform a sculpture in the round into a relief. 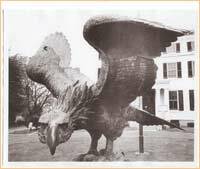 This original bronze eagle statue from the Alfred O. Deshong gallery was knocked over, and the wing stolen in an act of vandalism. Armed only with a photograph, Laran Bronze was able to scan the remaining wing, create a mirror image, then alter it to match the angle and spread of the original. Stainless steel armiture was installed into the base and new bronze wing for extra security.